Shopping for Kill Bill Mini-Figures? How about some deadly vipers? 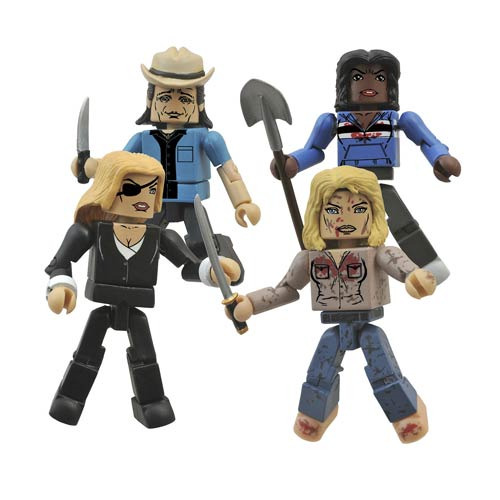 Beatrix, Vernita Green, Bud, and Elle Driver make up the fourth Kill Bill Minimates box set! Each 2-inch mini-figure stands 2 inches tall and features14 points of articulation, plus interchangeable parts and accessories. Designed by Art Asylum, they're packaged on a full-color blister card. Black Mamba. Copperhead. Sidewinder. California Mountain Snake. Along with Cottonmouth, these four killers made up the Deadly Viper Assassination Squad, commanded by the Snake Charmer, Bill. When Beatrix Kiddo was left for dead, she came back to kill every one of her old comrades. For ages 4 & up.